The music event of the summer returns each year to Westons’ sandy beaches bringing with it a whole host of your favourite celebrities and music acts. 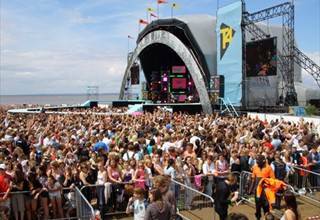 T4 brings to its audience all the major contemporary pop and rock music acts from the UK and overseas, and the typical audience size is over 40,000. Every act on the main stage plays a maximum of three songs and there’s plenty of fun and games involving the presenter’s and loads of your favourite celebrities to see between each band.